Landscapes are almost an integral component of most residential properties. They become the backdrop for the home structure, and when planned well can provide excellent opportunities to relax with and entertain friends in the comfort of your home. It’s also why many people install various outdoor features such as outdoor kitchens, pergolas, pavilions, fireplace and fire pit areas etc. in their yards. But there are times when the topography of the property is such that it doesn’t give you the scope to construct these features without making some alterations. The sloping or uneven land may have to be excavated and leveled to make room for the outdoor living elements, pathways, driveways or other features you want to be installed there. Once these areas are excavated, they would also need some supporting structures to prevent soil erosion and mudslides and this is where retaining walls are built. We at Emerald Creek Landscapes, LLC are a well-established company in the landscaping field and have been serving customers in Ringgold, East Brainerd, and Fort Oglethorpe. Our experts have successfully completed a large number of retaining wall design and installation projects across East Ridge, Dalton, Chattanooga and Red Bank as well. We have also catered to customers in Middle Valley, Cleveland, Soddy-Daisy, Calhoun and the surrounding areas and created beautiful and resilient retaining wall elements on their properties. As mentioned earlier, these walls are built to provide support to the landscape at points where there are chances of mudslides or soil erosion. But these aren’t just regular walls like the boundary wall or garden walls you have on your property. They are specially-engineered walls built using concrete masonry units and are available in a range of finishes and textures. We use retaining wall systems of the best brands to construct features that will be functional, long-lasting and aesthetically-appealing all at once. On our team are retaining wall installers that have the expertise and skill to design and install walls that will provide your landscape the support it needs and make it more sustainable. 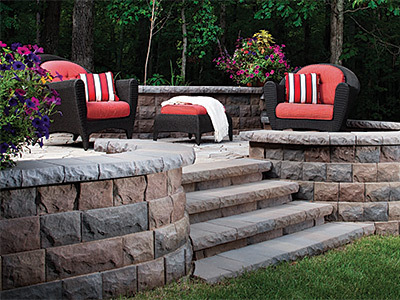 Many of our customers also request for custom-designed retaining walls that serve a dual function. We can design and build retaining walls with inbuilt planter spaces or seating in any area of your landscape. The latter becomes the perfect feature for the fireplace, fire pit and patio areas where you also need a certain amount of seating space. We design these walls to perfection and make sure that the installation is exceptional. If you want the concrete surfaces of the wall clad with either rock or natural stone veneers, we can do that as well. With the vast experience and expertise, we have developed over the years we know what it takes to provide excellent solutions at very competitive retaining wall cost. For any more information on our services or to discuss your project details, feel free to call Emerald Creek Landscapes, LLC at 423-593-5443. You can also send us your queries and project details via this online form. © 2019 Emerald Creek Landscapes LLC.